Kurkuri bhindi is a perfect tea-time snack which is made with ladysfinger/okra. 'Kurkuri' is 'crisp' in Hindi. Recently I received a request to review Philips Air fryer. I accepted the opportunity as I can try out recipes with new products and give my honest opinion about the performance of the product. Philips has introduced their Viva Collection Air fryers. The product which I received was Turbostar which cooks with rapid air technology. Philips claims tasty frying with 80% less oil. The product comes with a basket with an easy click handle, metal mesh and a recipe book. Some accessories like grill pan, rack and baking pan can be purchased from their store. I personally feel that Airfryer is a good option for low fat cooking and can be a healthy start. Cooking in Airfryer is an alternative to deep frying as we can use little or no oil. Health conscious people can prefer air-frying instead of deep frying. Whenever I buy a new gadget/appliance, I think twice and ask myself, whether it is worth to get it? As regards Air fryer, I always had the doubt if it actually fries in air? Now, having used it, I can say it is nothing but a small oven. Unlike the convection oven, we can make only small quantities. You can fry, bake, grill and roast in Philips Air fryer. Philips Air fryer is small but heavy. So, keeping it on counter-top would be safe. Easy to clean. As I cook only vegetarian, there is no unpleasant odour while cooking. Disclaimer: This review is done on request from Philips. The opinions are based on my personal experiences. Use your own discretion before buying the product. What all can be made? I have been using this for sometime now and tried some recipes. Masal/paruppu vadai, Kaarakari, chips, roasts, cutlets, baked samosas, biscuits/cookies, muffins, buns, bread etc. can be made. However, when I asked the demo person, about making poori and poricha appalam, he said poricha appalam can't be made as sit is very light and will be blown away by air. So, I did not take the risk of trying it. We can't make poori also. DO NOT TRY appalam or pappadam by brushing oil, as it is very light and will get blown away by the air. Click here for Ragi biscuits/Ragi cookies in Philips Airfryer. 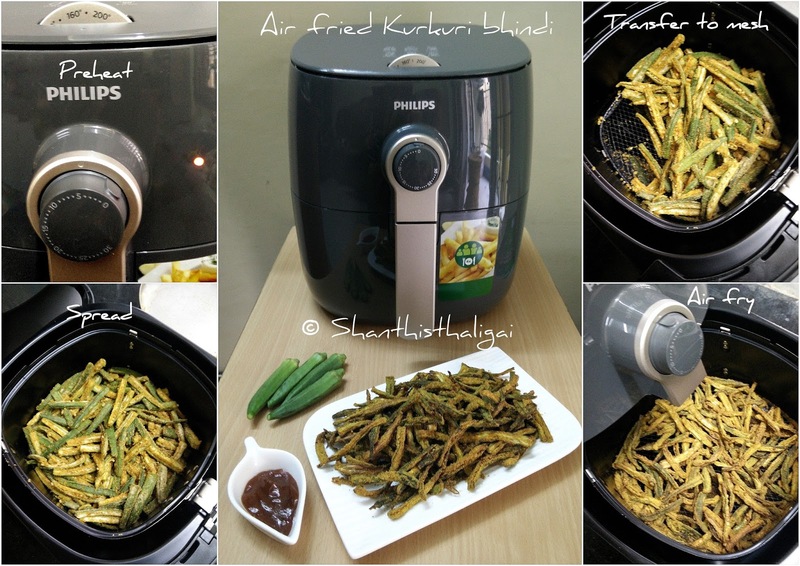 Now I am sharing an easy to make Air-fried Kurkuri Bhindi. Kurkuri bhindi is a perfect tea-time snack which is made with ladysfinger/okra. 'Kurkuri' is 'crisp' in Hindi. Usually, this is deep fried. As a healthier option, I made the bhindis in Philips Airfryer. I was able to break the bhindis and felt the crunchiness while eating. The pictures are pretty much self-explanatory. Anyway, the recipe also follows is how I made it in an Airfryer. Okra / Ladysfinger - 1/4 kg. Red chilli powder + Sambar powder - 1/2 tsp. + 1/2 tsp. Wash and pat dry okra. Remove both the ends and slit vertically to four pieces. Mix all dry ingredients well. Sprinkle this over the slit bhindis so that it is fully coated and well blended. Add oil and mix again with your hand. Preheat air fryer at 180°C for 5 minutes. Transfer the coated bhindis to the mesh and air fry for 15 minutes at 180°C. Take out the basket and toss in between. If necessary air fry / bake for a couple of minutes more until crispy. Yummy Kurkuri Bhindi / Airfried Kurkuri Bhindi is ready. Serve hot by sprinkling chat masala on top with a dash of lemon juice. Goes well with Rice and dal. A perfect snack with tea/coffee. Be careful and keep an eye after 12 minutes. Any masala powders can be added/substituted according to your tastebuds. Kurkuri bhindi can also be deep fried in oil. It can also be shallow fried. 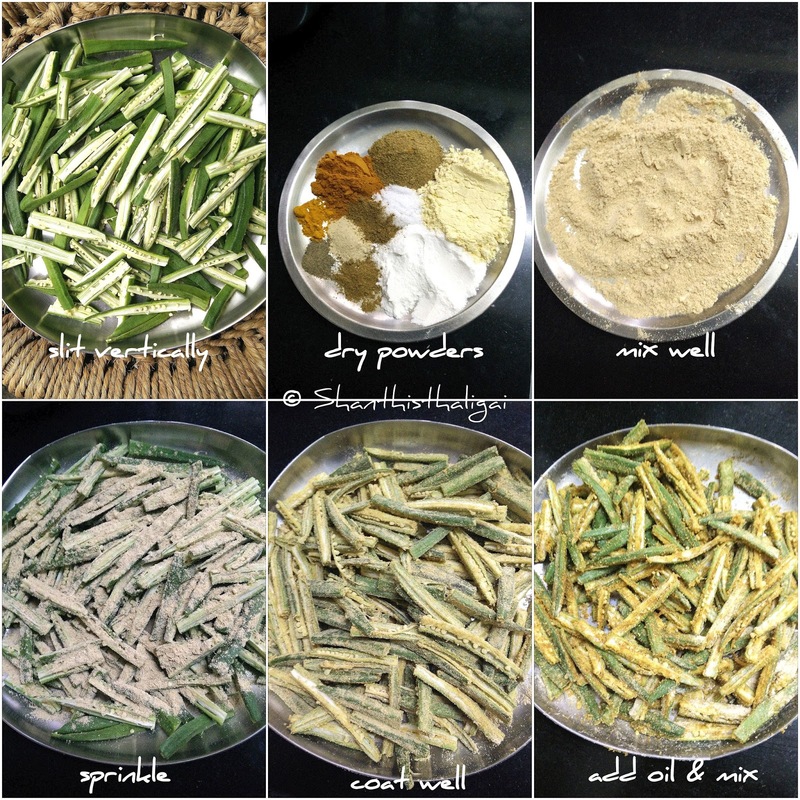 Thank you for sharing step by step procedure for Kurkuri Bhindi Recipe. I love to eat it and wants to make it early.